After anaerobic digestion, sludge is conveyed to a day tank for temporary storage. 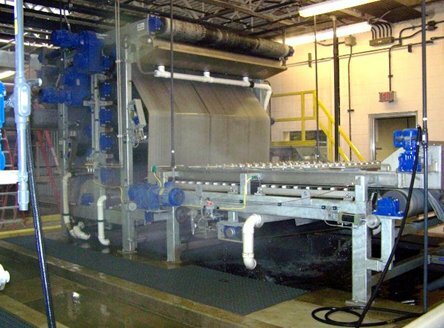 A sludge pump conveys the anaerobically digested sludge to the belt filter press to remove water. The thickened “cake” is conveyed by GJJWTF personnel to the Fulton County Landfill via truck for disposal. 75 to 100 tons of sludge is conveyed for disposal each day when the belt filter presses are operational.